Livestreams are one of the most engaging types of content on the Internet, and Mobil-Eyes-Us, a WITNESS initiative, builds up this content to help activists engage their audience deliberately so that they become more active, useful and “co-present” when they are needed. We had the chance to observe, test, and learn from the broadcasts we monitored for this initiative for the last three years, and now we’re sharing some of these key insights. If you’re planning your streams a previously scheduled session, take some time to prepare yourself and your audience. You can create a public event on Facebook or maybe just message people some minutes before you go live. Make sure to schedule the session when your audience is most likely available. For instance, you should avoid school hours if you’re aiming to reach students. You can draft a script to guide you during the stream: read and study about the main subject of your video, write some notes and also think of some “call to actions” in advance so it will be easier to engage your audience without being repetitive. 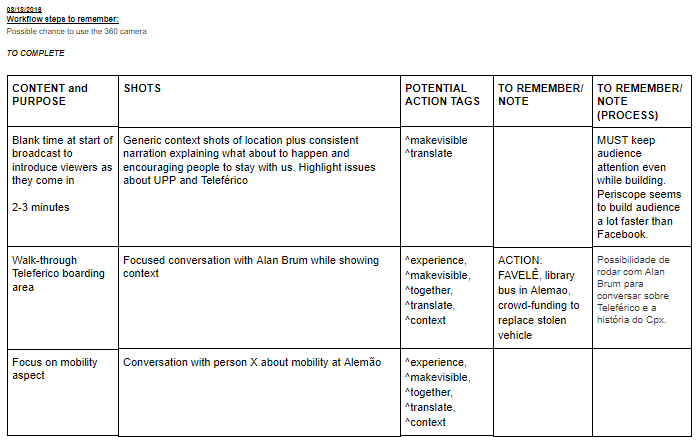 Below is an example of a prepared script for one of the livestreams we collaborated with Thainã de Medeiros from Coletivo Papo Reto during the 2016 Rio Olympic Games. The reach of your videos and livestreams increases in social networks based on the amount of engagement generated in the comments and reactions, both during broadcast as well as after the stream has been completed. As more people comment, react, tag and share your stream, even more will actually see your broadcast in their newsfeed. Explain this network effect to your audience. Refrain from treating people as customers. Try not to ask your fellow users to “follow, subscribe and hit the like button” just like all pleas so often repeated in streams and videos in general across the web, without explaining to them why this helps. When your followers understand the specific impact of each of their actions, they become more likely to engage on a deeper level and participate regularly, thus developing a strong and effective network of support and solidarity. Next time, these users will engage faster and more effectively, and they’ll be ready to spread this culture of co-presence and assistance to new incoming users. You can regularly ask people to engage every 3 to 5 minutes of your stream or when you don’t see much action going on in the video, depending on the total duration of your broadcast. Taking into account the different formats of livestreams, we will, in future publications, dig deeper into the best moments of each specific broadcast category, to encourage this participatory culture in your audience. As a way to support an active relationship of co-presence, you can ask users to be ambassadors and explain this culture of interaction to new incoming users of your current and future streams. While doing that, not only will they increase the impact of this proposed culture shift, they will also boost the post itself by adding new comments and interaction among users. At the same time, this strategy lets you be less repetitive about your messaging and so you avoid resembling the marketing approach usually used by influencers and brands. For even more tips on getting the most of your live videos check out this article. During the Rio Olympic Games pilot phase, we experimented with the idea of action tags- indicated with the “^” symbol that invited distant witnesses to share with ^makevisible, make themselves present with ^bepresent, among other ways of being co-present. Instead of a #hashtag, we used an ^actiontag to provide a signal to distant witnesses and viewers of actions that the streamers wanted them to take. For example, in the stream above, we had full historical context of the eviction process that Vila Autódromo went through from visual anthropologist Antonia Gama with live comments during our broadcast—who worked alongside local residents to document via video many of the illegal tactics used by municipal authorities so to hold them accountable for it. Since this was a contextual video that was part of a series of videos denouncing human rights violations related to the Olympic Games, we invited supporters to share this historical and informative content using the actiontag ^ makevisible. On the following day, we had the opportunity to broadcast live alongside Thainã de Medeiros with historical contextualization commentaries from architect and urbanism researcher Rodrigo Bertamé. In addition, we were able to correlate the violations that occurred in Complexo da Penha with those in Vila Autódromo. 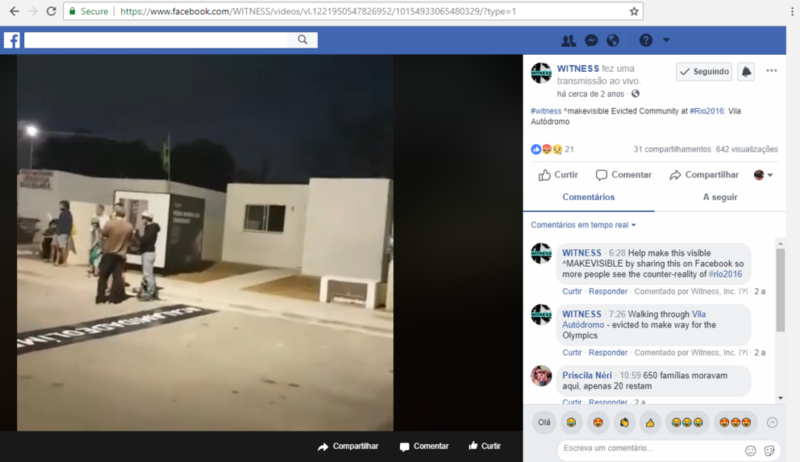 All this was done within the Facebook comments section and with additional collaboration from other activists and WITNESS team members, which helped boost the network effect with reliable, contextualized and engaging content. We also created events like this one to keep people updated and aware of the relation between the series of live videos. The event also facilitates people’s scheduling so they can be available when we’re live. Always keep the conversation flowing with your audience. Paste links to articles regarding the issue so your audience understands the context and repeat important information that might be useful later on (police license plates, specific events with the timestamp of when they happened, etc). Ask users to help research and write down this relevant information. It will give them a sense of purpose, but only if you follow up when these collaborations unfold into results. Users will then have concrete feedback on how their contribution is making an impact. We have seen this by observing how communities usually behave in new social media platforms. During the pilot phase of Rio 2016 Olympic Games, we experimented with different ways of presenting relevant context in a series of broadcasts we did in partnership with Coletivo Papo Reto and activists from different parts of the world that collaborated as distant witnesses. 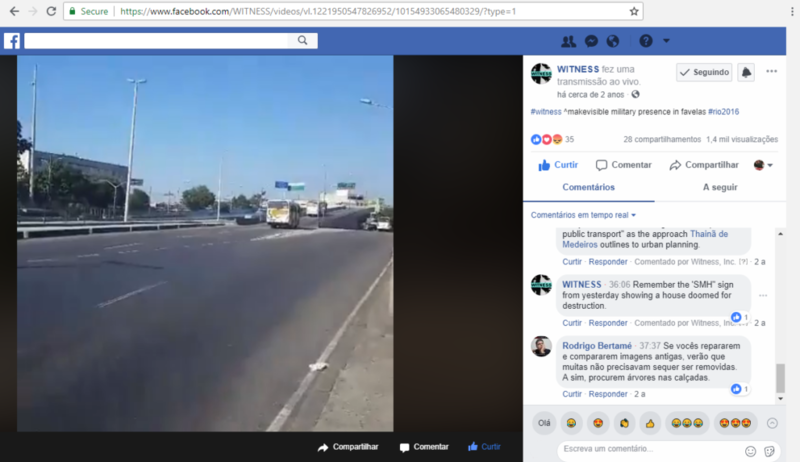 In an early stage of the initiative, we focused on sharing context through comments within Facebook or Periscope livestreams using previous streams themselves as an important source of information. Here is an example from a series of four livestreams on August 18, 2016. The streams focused on explaining how residents from favela da Skol—named after the abandoned beer factory—suffered evictions for over seven years of broken promises from the government, and how families were receiving substandard rent assistance that was not enough to maintain their standard of living, which forced them deeper into poverty. The first live video was the shortest broadcast in the day’s series due to connectivity issues—a common problem with livestreams in a place that had little wireless signal or a lot of mobile internet interference. So it did not allow for many real-time interactions, such as linking to articles that further explained the circumstances of the location. However, we explained the technical constraints to the audience and that we were aiming for a series of livestreams with narrated content, in Portuguese and English, offering historical context of the area’s occupation and eviction process. These streams also served as context for the following videos of the day and the initiative as a whole. First video in a series of four livestreams from favela da Skol, at Complexo do Alemão. Since it was a contextual video we asked supporters to make this story visible with the ^makevisible actiontag. In the second stream, as well as in the third and fourth, it was possible to further inform about the history of the place by interviewing residents and complementing it with comments that included links to previous recordings and publications relevant to what was being said in the video from sources like Coletivo Papo Reto and pages created by the residents themselves as a form of online mobilization. We included a link to the Facebook page maintained by Camila—a resident, activist and an important part of favela da Skol’s leadership—so people could connect with her more directly. We also linked to an online petition made by the residents to pressure Rio’s Governor. 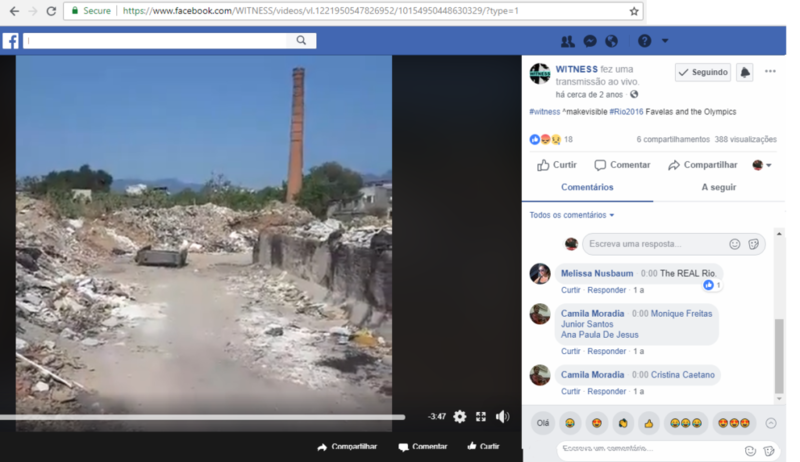 We added a Rio on Watch story about the favela da Skol’s eviction in Portuguese and English and referred our followers to live.witness.org both during the stream’s narration as well as in the post’s comments so they could find more in depth contextualization. A Q&A session is also an excellent opportunity to boost your post’s reach while also creating a deeper relationship with your audience. It gives you the chance to learn what interests them, but also to understand what online skills they can contribute to help enhance your publications. In what devices do users ordinarily watch the streams? After knowing this, you can decide whether to stream vertically or horizontally in your upcoming streams. What captivates them to come into a stream and stay in? Explain that their response will help enhance your future broadcasts and your relationship. Remember that keeping an honest and transparent relationship with your audience makes you more reliable to your community and strengthens these bonds. What information catches their attention when reading the links that provide context? Not only will your viewers be better informed, but you’ll also enrich the conversation in the comments section with more detailed information about what is happening in the stream. Users will appreciate that you are taking the time to connect and inform them further. It’s very helpful to connect with your audience if the action in your broadcast slows down so to keep your audience interested in the meantime. Keep in mind that there is a delay created by Facebook to make the broadcast viable. Since the delay time will vary on the device used and bandwidth available, you should test how long it takes your audience to interact with your information by monitoring their reactions in the comments section. The end of your broadcast doesn’t mean you are done! You can still answer comments after the stream is recorded, and doing so will give you an extra boost on reach and create a deeper relationship with your audience. Make sure you pick a time of the day when people are inclined to be online so that new comments pop up in more news feeds. Check and improve the thumbnail of your video if needed. You can pick from ten different moments from your broadcast or upload a custom image from your computer. You can also edit your title, include more links and tags to your post as well. 85 percent of videos on Facebook are watched without sound, so adding captions to your live broadcast is a good practice to consider. It’ll boost your stream even further and it will increase the likelihood to get to the audience that quickly scrolls through the news feed and that can only get hooked in the first few seconds of your content. Hopefully, they might save it to view later and better engage with your ask and content. For example, here in this series of four streams (1,2,3 and 4), we added summaries and further information with relevant links into a public hearing – held by the Land and Housing Center of the Public Defender’s Office – that we had the chance to broadcast just ten days after the closing ceremony for Rio 2016, when favela da Skol residents, among other hundreds of families, were facing the possibility that even existing rent subsidy would go away in Rio’s post Games financial crisis. So, to summarize: first, you need to plan ahead your stream and make sure people are aware of it. When you’re broadcasting, don’t treat people as customers or a passive audience, interact with questions and explain to them why their engagement is important instead of just asking them to subscribe or like your page. While streaming, also enrich the subject you are covering with context, providing links or references in the comment section, for instance. And after you’re done, remember to continue improving your content by tweaking descriptions, adding pictures captions. Doing so, users will be equipped with a new way to support causes that they are passionate about and to dodge the algorithm that keeps us in sheltered, unsupportive and uncollaborative bubbles. The first step towards change is to understand that by simply using social networks, we can have a real effect on the issues we care about. We can leverage the day-to-day social network activities like sharing content, reacting, interacting in the comments by tagging pages and friends to visualize the collective power we all have for change. Progressively, we can then move towards a stronger participatory culture by using even more powerful tools to connect us regardless of geographical location or personal skills.